The Carter Family descend from several generations of construction workers and builders. Benjamin Howard Carter I (1792-1853) was based in Wrentham and was a bricklayer. His eldest son, Benjamin Howard Carter II (1821 -1893), moved to Southwold and started what became a substantial building business in 1861. His eldest son, Benjamin Howard Carter III (1853-1927) was a bricklayer in the business before taking it over in 1893. His own eldest, Benjamin Howard Carter IV (born 1880 and the last to carry this set of names) was a carpenter who emigrated to New Zealand, but his brother, Arthur Ponsonby Thorp Carter (1887-1926) stayed in Southwold and took over the business, transforming it from a building contractor to a shop selling china and glass. 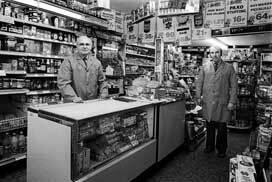 Arthur P T called his own eldest, Arthur (1913-1995) and he inherited the business in turn, as did Arthur's son, Ronald (Ronnie, born 1945), the last owner of the business. We are most grateful to Andrew Bootman for allowing us access to his family research into the Carter family. Benjamin Howard Carter II – Bricklayer, builder, paper hanger and house agent (W 1874). BH Carter built the houses in St Edmunds Terrace across the road which are dated 1875 and which are famed for their corbel heads based, it is said, on caricatures of contemporary local people. Benjamin and his wife Sarah had a son, Francis, who worked in the business and became the father of well-known local cartoonist, Reg Carter (1886-1949). See No 78 High Street. Benjamin himself dies in 1893. Benjamin Howard Carter III - B H Carter & Sons – Builders, Contractors, paper hangers, Oil & Colour Merchants (K1896) The founder having died three years previously, B H Carter III has taken over the business, having previously worked as a bricklayer for his father. Arthur Ponsonby Thorp Carter – Carter & Son, China and Glass Dealer (K 1924). 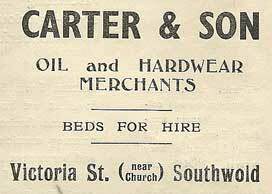 A P T Carter has taken over the business but dies young (age 39) in 1926, a year before his father. Mrs A Carter – Carter & Son, China and Glass Dealer. 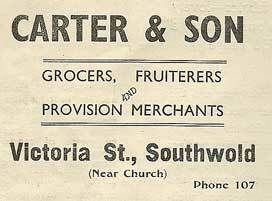 Mrs A Carter is the widow of Arthur PT Carter and the business now appears to be in her name. (K 1933 & 1937). She has branched out into pram and pushchair hire as the 1930 advert shows. 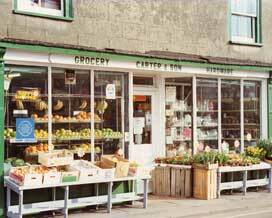 In 1937 Mrs Carters business also encompasses the grocer’s shop next door at No 12 but this becomes purely residential two years later. In the shop, which spans Nos 14 to 18, she sells wallpaper by the roll. Prices are from 3d a roll. 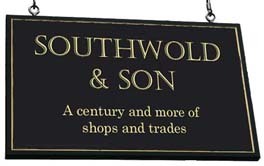 Carter & Son are also iron-mongers and oil merchants. They have an oil delivery round which was originally run by pony and cart but, later in the 1930s, by motor van which enables them to serve customers as far afield as Wenhaston. The shop closes ‘for the duration’ as so many of the staff have been called up. Arthur Carter - 'Carter & Son', Arthur is the eldest son of Arthur Ponsonby Thorp Carter and is 34 this year. He reopens the shop after the War as a grocery store with general hardware and china and glass. Ronnie Carter - Carter & Son. Groceries, hardware, china, glass. His father, Arthur, dies in 1995. The shop is finally closed and the building converted to residential use. 'Carters row' today. No 12 is the grey house at the far end. 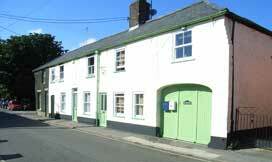 No 18 is the near house with the archway. The right hand pillar of the arch carries the initials of Benjamin Howard Carter and the foundation date 1861, below. A pair of advertisements for the two aspects of Carter's business in the 1936 edition of Southwold Visitors List. 1946 advertisement in the Souvenir Programme of the Southwold Victory Celebrations, announcing their reopening. Ronnie Carter (left) as a boy in September 1954. Arthur Carter is seated second from right. 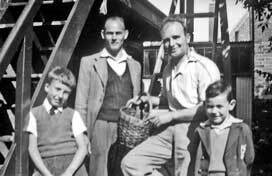 They are pictured with their friends, Jack Bootman and his son Michael. The picture was taken on the stairs leading to the upper floor of what was called 'The Barn' behind Nos 14-18. The ground floor was used for shop storage, part of the upper floor housed Ronnie's train set and model cars. Photo courtesy of Michael's brother, Andrew Bootman.